Although residents have full tenancy contracts till December 2008, quality of life in some parts of the Airbase is no longer what it used to be. Last week, morning birdsong was drowned out by the din from a building being torn down. One of the 2 disused hangars was being brought down . These used to be fully functional hangars with access to the runway. However, after the incidents on 11th September 2001, for security reasons, access to the runway was sealed off, and the two hangars have become disused. 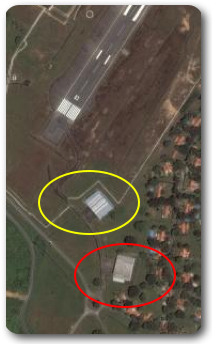 The hangar circled in red is almost gone, the one circled in yellow remains intact. Dump trucks have been depositing sand to fill the trench around the torn down hangar. Why this is being done now, with another full year to go before serious work can begin, is a mystery. It is also hard to see why work is starting at 7 am on weekends. References to Health and Safety standards seem vague, despite previous tragedies. It is hard to imagine any other first world nation expecting its residents to accept noise and dust as acceptable quality of life.